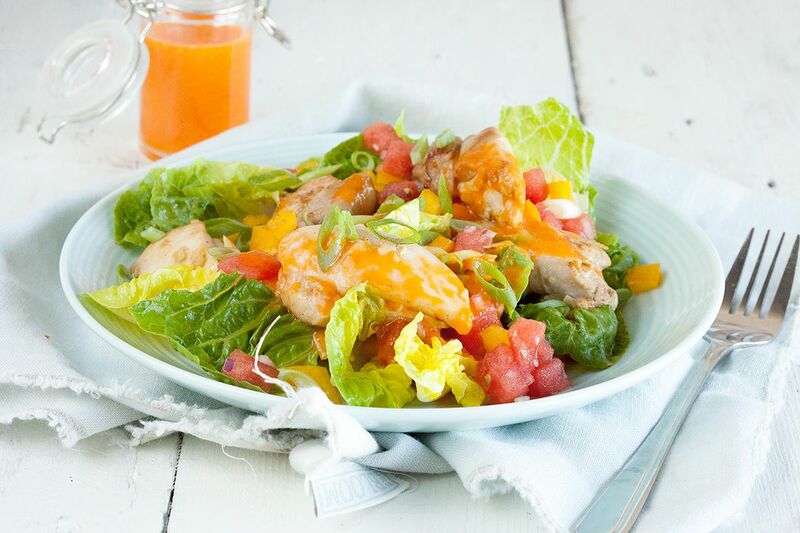 Very refreshing salad with marinated chicken thighs and watermelon, best enjoyed in the sun! Serve with bread to complete the meal. GRATE 1 of the lemons and use the juice of both lemons. PEEL and finely chop the garlic cloves and mix with the lemon juice and zest. ADD about 3 tablespoons of sunflower oil while you keep on whisking. SEASON with pepper and salt. CLEAN the chicken thighs if necessary and cut them into pieces. MARINATE the chicken in the lemon for at least an hour. RINSE the leaves of the little gem and use a salad spinner to get rid of any excess water. Now for the watermelon, we’re using only a quarter (1/4th) of a whole melon, 1/4th of that part is for the dressing and the other 3/4th is for the salad itself. CHOP the 3/4th into pretty cubes and add the other pieces to a bowl for the dressing. 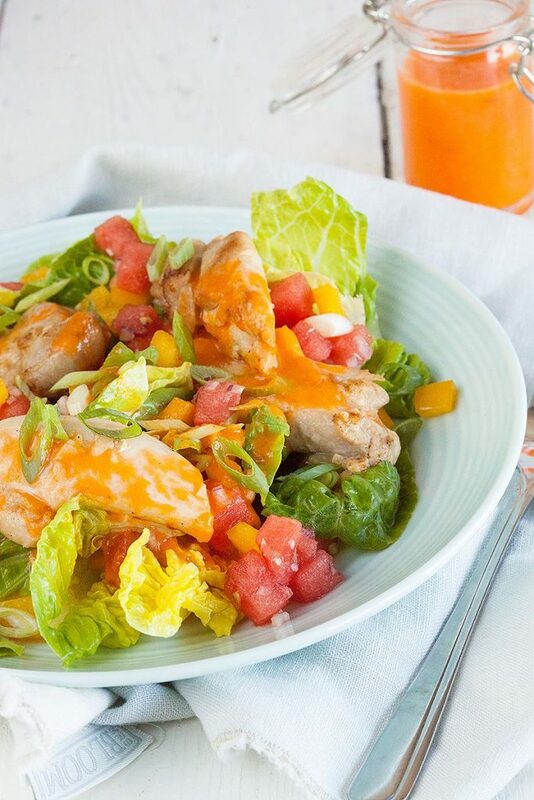 Use a (immersion) blender to create a dressing with the watermelon pieces, white wine vinegar, pepper and salt and then slowly add about 100 ml sunflower oil. REMOVE the seeds from the yellow pepper and chop into cubes. PEEL the red onion and finely chop it. 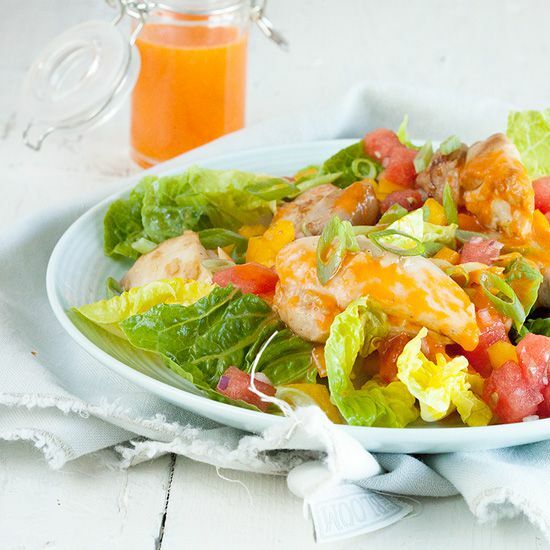 COMBINE the watermelon cubes, yellow pepper and red onion and set aside. CHOP the spring onions into rings. DRAIN the lemon marinade from the chicken thighs. HEAT a medium-sized skillet and add the chicken thighs. COOK them on high heat for about 5 minutes, depending on the size of the pieces. DIVIDE the lettuce and watermelon mixture over 4 plates. 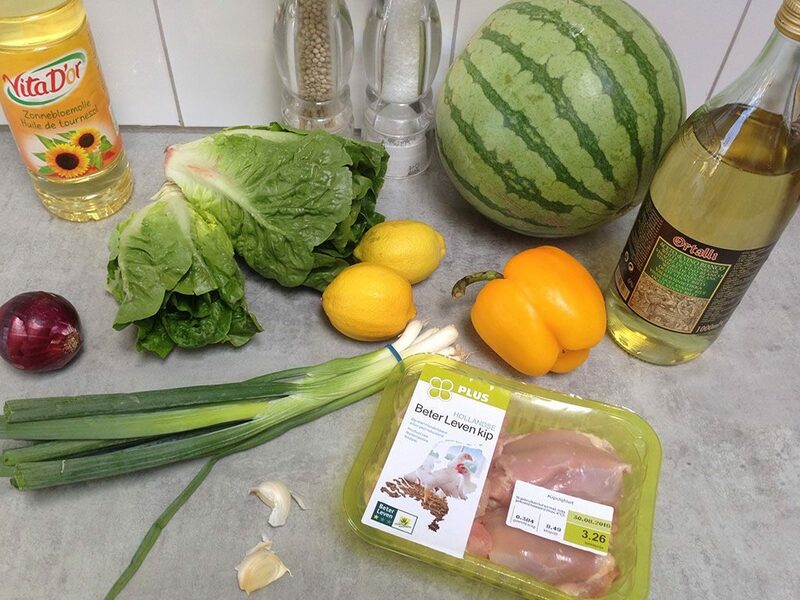 Then divide the chicken thighs and spring onions and finish it off with watermelon dressing. Enjoy!